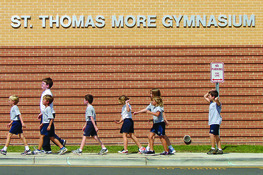 For over 50 years, St. Thomas More Catholic School has been a nexus of faith and learning in the heart of Chapel Hill, North Carolina. As the second largest institution in Chapel Hill, we are dedicated to the long term well-being of everyone in our community. We are also committed to providing the highest standards of education and facilities. Our efforts are made made possible thanks in large part to the contributions of our volunteers and donors. If you would like to join us in our effots, please make a donation. A significant donor interest in our school, and a sustainable practice seen in many long-term Catholic school institutions, is the development of an endowment from which a consistent yield is applied to tuition assistance or aid. General Sub Fund: utilized to improve facilities and resources to keep pace with technology as well as capital improvements in the school building. Grassroots Sub-Fund: utilized to increase the financial support of our teachers and maintain their salaries in line with those teachers in the public school system as needed. Jubilee Education Sub-Fund: utilized to help defray tuition expenses for students in need of financial assistance. The Governing Body will be Pastor and Principal, the chair of the St. Thomas More Finance Council, the chair of the Advisory Committee and other lay leaders as assigned by the Pastor. All disbursements will be subject to approval by the Governing Body. In order to maintain or increase the purchasing power of the Fund over long periods of time, five percent (5%) of the average market value of the fund for the previous three years will be distributed. Distributions will be quarterly unless otherwise communicated. Please contact the school office if you are interested in donating or need more imformation.